I’m sure there are one or two people wondering what is going on with the Dolphin Viewer lately. To put it simply, my life has been quite hectic the last few months, and it still is. I have a new job that demands a lot of my time and attention. I’ve moved to a different province because of the job, and when I am actually home (the new job involves a lot of travelling), I’m just too damned tired to spend time on working on the viewer. That being said, there will be a new version, that will have all the new shinies from the Lab. The CHUI interface, SSA, Materials, you name it. Just … please do not ask me when. “When it is finished” is all I can say right now. P.S. If you click on the link on the login page that says “Click here to update your viewer” (see screenshot), you will get the original viewer from Linden Lab, not a new Dolphin Viewer. I don’t know what’s with these spam bots lately… but I’ve had almost as many spam comments in the first ten days of 2013 as I had in the whole year 2012! To deal with this problem, I’ve added WP-Unite to the site. Basically, to post a comment on the blog you need to login with a valid forum account. To get a forum account, go to the Dolphin Viewer Mountain Retreat, and generate it at the blue terminal next to the wind turbine. If for some reason you can’t create your forum account there, contact me in-world. 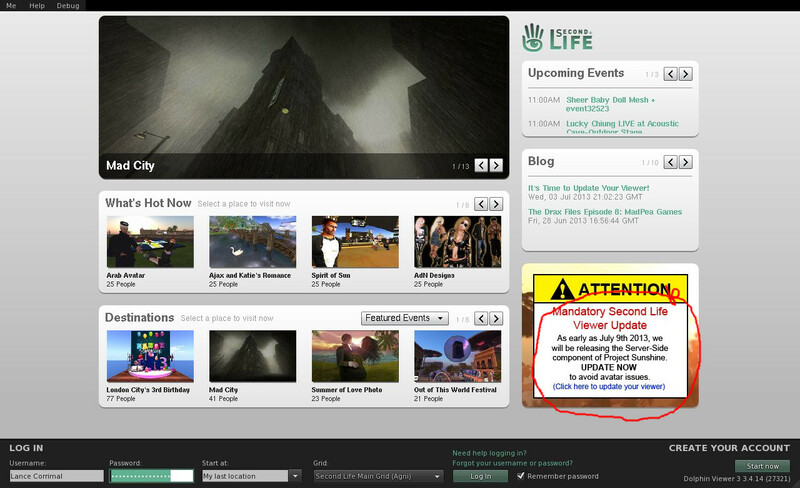 This means that you need to have an active Second Life™ account to be able to comment on posts on the blog. On this occasion I would like to point out that for any support questions you should use the forum anyways, and not by posting comments on release announcements.